Silver spot prices followed gold prices lower yesterday, and ended the silver trading session with a wide spread down bar, which came as no great surprise following the recent sustained period of sideways consolidation at the $18 per ounce price level, which finally proved to be a bridge too far for the industrial commodity. The technical picture for silver is of course slightly different to that of gold, which is constantly breaking into new high ground, unlike silver which is having to battle through some heavy resistance in the $16.50 to $18.50 price zone and indeed the daily silver chart looks marginally more bearish than for gold for several reasons. First, the 9 day and 14 day moving averages have now crossed giving us a bear cross signal. Second, the close of the day ended the silver trading session below a previous top in the rally, and finally the $18.00 price level has now created a sustained area of resistance which we need to penetrate and hold above for any move higher to continue. 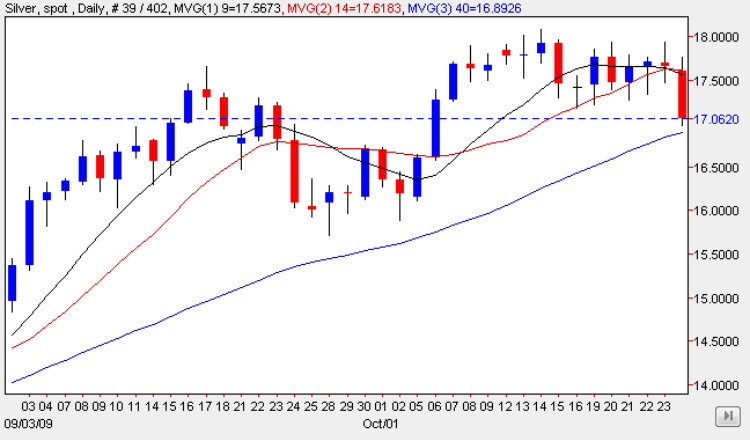 However, this negative analysis is counterbalanced by the support from the 40 day moving average, which prevented silver prices falling further yesterday, a positive signal. So in summary, a mixed picture at present, but technically I believe this is simply a short term market correction and that the bull rally of the last few weeks will continue in due course, with the above reversal simply being a pause point in a longer term bull rally for spot silver prices.